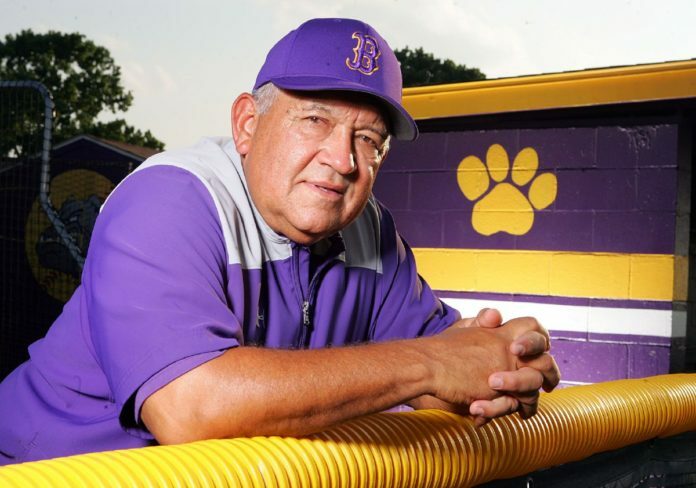 McALLEN — When the McAllen High baseball team got back from Laredo, coach Eliseo Pompa gathered the team and recited a quote he had recently received from a friend. “It kind of perked the team up a little bit,” Pompa said. The team was still smarting from a loss to SA Churchill in the Class 6A Region IV semifinals, but Pompa wanted to make sure the kids left on a positive note. Pompa’s season was not just defined by the success his team had on the field, it was also defined by the potential pitfalls he avoided and the tweaks he made along the way. For his role in guiding the Bulldogs this season, Eliseo Pompa is The Monitor’s 2017 All-Area Coach of the Year. Pompa’s decision on how to utilize freshman phenom Aaron Nixon was vital to the success of the Bulldogs. Nixon came into the program with a lot of hype, having committed to the University of Texas before he had even played one inning for Pompa. Many coaches would have rushed Nixon into the ace role and had him pile up innings from the beginning, but Pompa took a patient approach that paid dividends down the stretch. It allowed Nixon to easily transition into high school ball and it was easier on his arm, which should be a valuable weapon for the Bulldogs for the next three years. The move paid off in the Bulldogs’ playoff run. Nixon was still fresh and bringing him into the game late all but assured McHi a win. He was dominant in short stints and rarely even gave up a hit. In a similar move, Pompa knew transfer Abanny Garcia had the skill to be his ace and he made the decision quickly to put him into that role. Garcia flourished at the top of the rotation, pitching 35.1 innings and posting a 1.39 ERA with 60 strikeouts. Pompa also helped several seniors take big steps forward in their final year. Ramiro Maldonado, Roy Quintanilla and Keola Zamora all had breakout years that propelled the Bulldogs to a district title and a playoff run that saw the Bulldogs last longer than any other Valley team. Pompa has already turned his focus to next season’s team.